Shortly after 2:30 a.m. on March 22, 2018, deputies from the Big Bear Sheriff’s Station responded to a call of shots heard near the 100 block of Highland Avenue in Sugarloaf. During the investigation, deputies located shotgun shells and bullet casings in the driveway of a home. At that time, the house was dark and no one answered the door. Deputies conducted a follow up investigation during daylight hours and contacted the resident of the home. The resident confirmed there was a shooting at the house. Deputies identified Brett Adams, Emanuel Gonzalez, and Jesse Rodriguez as potential suspects and determined they went to the house with the intent to rob the victim at gunpoint. When the suspects arrived, Adams attempted to shoot the victim but was unsuccessful. The suspects fired shots towards the residence and fled in a dark-colored pickup truck. Deputies determined the suspects took the guns used in the robbery to a residence in the 1000 block of North Greenway Drive in Big Bear City. 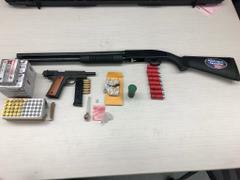 Deputies searched the house and recovered a shotgun and a handgun that was used in the robbery. Brett Adams, Emanuel Gonzalez and Jesse Rodriguez were taken into custody without incident and booked into the Big Bear Jail for being under the influence of a controlled substance, robbery and shooting into an inhabited dwelling. All three suspects were transferred to the West Valley Detention Center; their bail is set at $250,000. Deputy reports were forwarded to the District Attorney’s Office for review and potential filing of additional criminal charges. Arraignment hearings in this matter are set for March 26 in San Bernardino County Superior Court.